The Pentel EnerGel Multi-function pen features two 0.5mm liquid gel ink refills, one black one red, as well as a 0.5mm pencil and an eraser at the top of the cap. I am a big fan of EnerGel ink as writes similar to a rollerball but dries as fast as a traditional gel pen. The EnerGel is thinner than most of the similarly priced multi-function pens and as a result feels more comfortable in my hand. Red refill deployed as indicated on the barrel. To deploy the different pen and pencil points you simply twist the cap to the indicate positions on the barrel. It’s not a smooth action and to me it feels pretty unpleasant. Also it can be a bit confusing to switch points. You have to remember that the red is the middle point. For instance if you were to switch from the black EnerGel refill to the pencil you have to pass over red; if try you to simply go from black to the pencil you will unscrew the barrel. The design of the this pen is a real pig’s breakfast. I am not sure what they were thinking of but it looks terrible. There are so many non-related design elements to this pen that I will just let the pictures do the talking. I purchased this pen on my recent trip to Japan at its retail price of 500 Yen (about $5 USD). I like the EnerGel refills and the pencil works quite well but with the unpleasant twist mechanism and hideous design I don’t think it’s a winner. That is a fair point; it is a good amount of pen for $5. Thank you for reading! That is a really ‘interesting’ design. 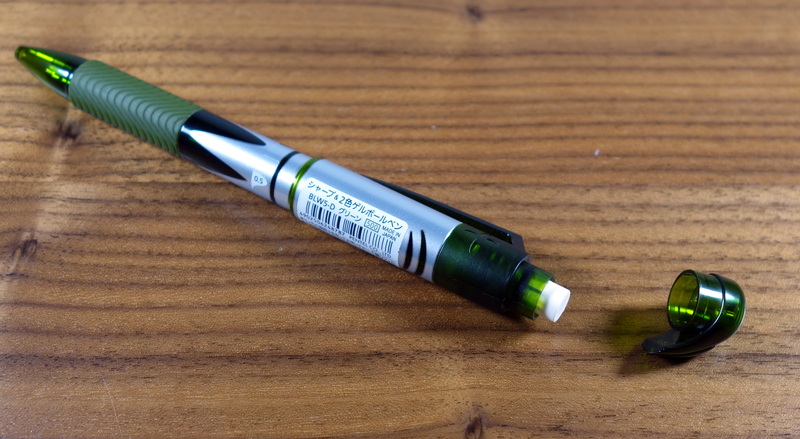 Useful if you just need a functional, multi-purpose pen for on the go – I’m tempted to pick up something similar for my upcoming trip – but not something you’d want as an everyday pen. 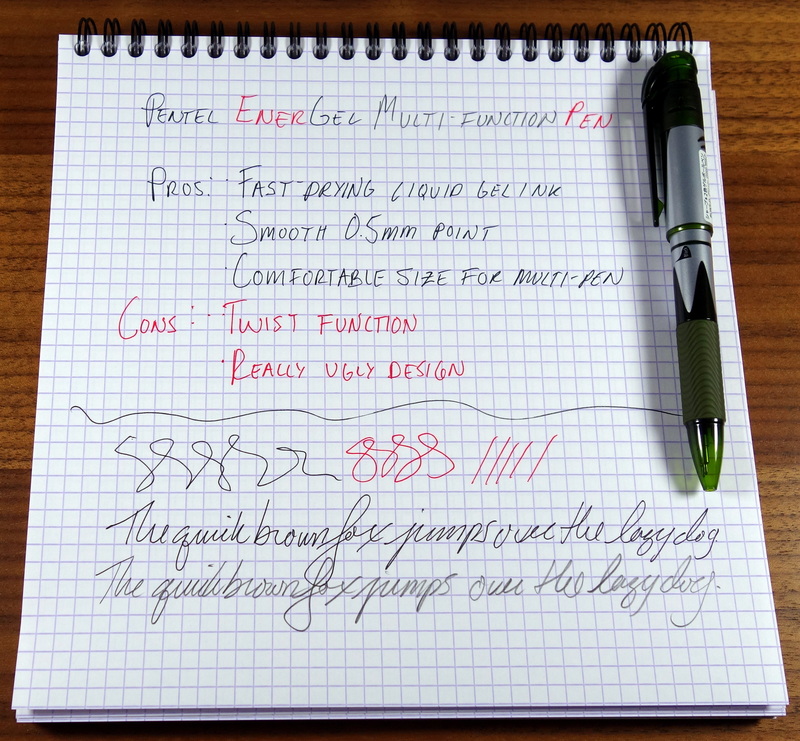 The EnerGel ink is definitely a selling point, I love how smoothly it writes. I really like EnerGel ink but if I needed a multi-pen a Pilot Hi-Tec-C Coleto would probably be my choice, though the ink is not as fluid as the EnerGel. Thank you for reading!